Bollywood actress Kareena Kapoor has never disappointed the fashion police no matter what occasion she is in. The Jab We Met actress was snapped at the Mumbai airport on December 4, 2018. Once again Kareena grabbed all the attention with her stylish outfit for a travel outing. The actress sported a sky blue pullover with a matching track pant and completed her look with white sneakers, brown aviator glares and a brown bag. Kareena recently appeared at Deepika Padukone and Ranveer Singh’s wedding reception and looked great as she posed with husband Saif Ali Khan. Reports say that the actress will soon appear on the sixth season of Koffee With Karan hosted by Karan Johar. The Udta Punjab actress is expected to make an appearance with the new bride Priyanka Chopra. 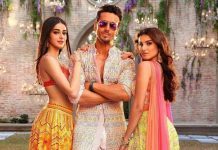 On the work front, the actress was last seen in the film Veere Di Wedding and will be seen in the upcoming film Takht which is a directorial by Karan Johar. Kareena has also signed for another Karan Johar production Good News.